“It has been a few days now in recovery after one of the best planned golf trips I have ever experienced. 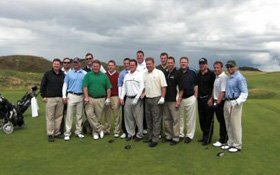 Me and the 15 other golfers had an absolutely fantastic time on Ireland/Scotland golf trip you organised. The drivers in each location were superb and kept the entire group on time for our golf, plus were extremely accommodating when asked for information or went above and beyond their duties. Our hotels were located in prime locations and had everything one could want from the service to the room itself. I will strongly recommend your group to anyone planning a trip like this in the future. You even had a hand in the weather because we only spent a total of 14 holes in the rain out of the 188 holes played.